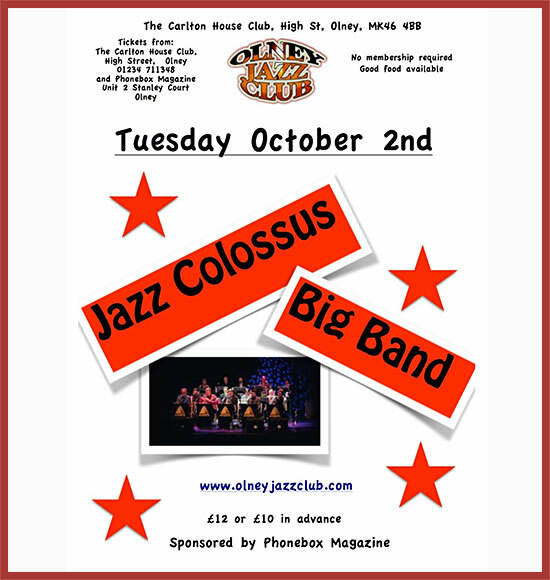 Jazz Colossus have performed at a variety of venues, events and festivals across the UK and beyond. Last year they were invited to take part in the prestigious International Big Band Competition in Hoofddorp, The Netherlands, performing alongside top big bands from across Europe and beyond. Tel 01234 711348 to reserve tickets. Why not book a table to dine…the Jazz Night Menu features 2 main courses for £12. So there’s lots to look forward to…..hope to see you at OJC soon! Jazz&Jazz is grateful to Olney Jazz Club for their reciprocal support. Filed Under: Features, Jazz Art & YouTubes & "Gripping Yarns"